Making Holiday Memories – New Jersey artist Lloyd Garrison has prepared a pair of new holiday cards featuring paintings of the area. 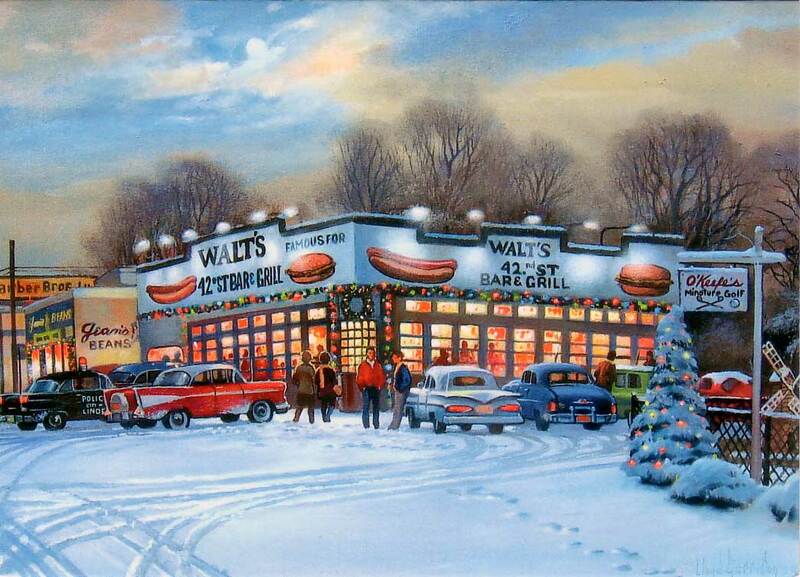 Walt’s, pictured above, was a favorite hang out for Rahway and Linden residents in the 1950s and 60s, Garrison says. “It was a place to meet old friends and make new ones. Very few places like that can be found today,” the artist said. “They had the best hamburgers and hot dogs.” Garrison pointed out that to the left of Walt’s was Jean’s Beans and to the right was O’Keefe’s miniature golf course. Garrison’s other holiday card for 2009 features a downtown view of modern Cranford. For information about purchasing the cards, call Lloyd’s Gallery at 609-918-1776 or visit www.lloydgarrison.com. O Christmas Tree, are you eco-friendly? For many people, it’s not Christmas without a tree. Many of these same folks care about the environment enough to wonder: “What’s the most eco-friendly Christmas tree?” Finding the greenest option isn’t as cut and dried – pun intended – as you may think! The best choice from the Earth’s perspective may be a live, potted tree. Depending on how fast your tree grows, it can either remain potted and reused next year, or it can be transplanted outside. The end result is another live tree doing its best to best to bring peace on earth and clean air to humankind.